The Wacky Rig Is The Height Of Simplicity And Effectiveness. What The #&!+? * Are Those? 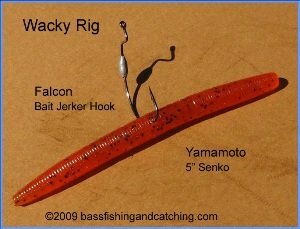 A wacky rig, which consists simply of a "wacky worm" impaled on a hook through the middle of its body like the Senko shown at right. It is primarily a clear water presentation that is most effective, though not exclusively so, during spawn and post-spawn. Simple to rig, simple to fish, that's the wacky rig. OK, So What's A Wacky Worm? 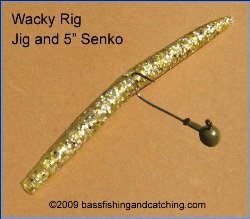 Though many think of a "wacky worm" as a Senko the concept is much broader in scope. 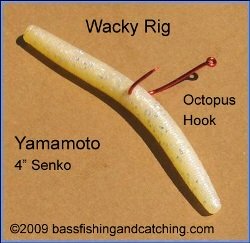 No doubt Senkos work great as the worm part of the rig. The weight and shape of a Senko Worm results in a very enticing fall on its way to the bottom. If you give it a little twitch here and there on its way down it really comes to life. Once on the bottom deadstick it as long as you can stand. They will sometimes be picked up on the bottom but strikes most often occur on the drop or after you begin to move it after a period of "dead sticking". But don't limit yourself to them when "fishing wacky". Basically, a "wacky worm" is any soft plastic worm you hook through the middle and fish accordingly. 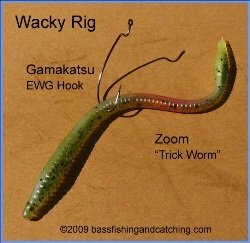 It could be a Zoom "Trick Worm" like this one for example. Why Not Wacky Rig A Fluke? Flukes and other soft jerk baits work great as "wacky worms" too. They can be hooked through their middle in the traditional style or by entering the hook point through the bait's side at its "midline" and out its back approximately at the back's edge. These are good for skipping under overhanging willow trees and other waterside vegetation. Try them along bluffs. They work great! 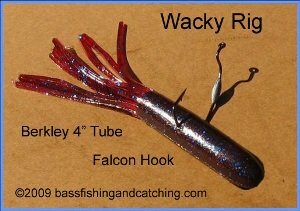 Tubes work well when wacky rigged on either a weightless or weighted hook. Put a little BB sinker in its nose and you'll get a "nose down" drop when fishing them on a weightless hook. When a group of bass fishermen get together and discuss the times they've had bass bite their lures I bet many of would say they happen most often on the fall. It's a fact, that's when many strikes occur. That's why many lures are struck not while being retrieved but when the lure is paused and allowed to drop. The more action a lure has on the fall the better the chances it will get bit. That is why the wacky rig presentation and its inherent fall is so effective. When a wacky worm is combined with a jighead the action on the fall can be magnified. When the jig falls it is literally pulling the worm down from its middle and the two ends wiggle is more of a vibration than a subtle undulation. 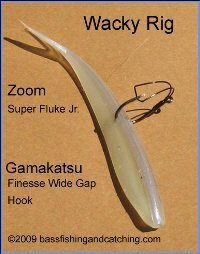 There are numerous "wacky jigs" on the market which generally don't have barbs. Why? Because this supposedly allows the worm to "freely" slide into the hook's bend without hanging up on a barb where the hook shaft enters the head. I'm sure they all work as professed but I've found just about any round head jig with an open gap works well for me. If I have one with a barb I just mash it down with pliers. Using a jighead is a good way to get your wacky rig deep down to bottom structure. As an alternative to using a jighead a nifty technique with wacky worms is to put a piece of nail in the head of the worm. This allows you to fish deep structure for smallmouth in warm weather. Doing this also causes an irregular fall while the worm is gliding to the bottom. Just cut yourself some nail weights from hardware nails. You can cut them the size and weight you want. It's dirt cheap too. The best tackle for fishing a wacky rig can vary depending on the type and thickness of cover and depth of water you're fishing. However, it is pretty well established that a spinning outfit is ideal. Pick a medium action, 7' rod and combine that with medium size reels like a Shimano 2500 Stradic (ST2500FH) or Shimano Stella (STL2500FB) spinning reel. Seek a reel with a rock solid drag system. The longer rod allows for longer casts. For example, I have the All Star tube rods #1 (TAS843STR) and #2 (TAS845STR) I use for wacky fishing. One is medium light, fast and the other medium, fast. Both are 7" long. With these I use either the Stradic or Stella mentioned and a Daiwa SS-II (SS2-2500) spinning reel. What line should I use? The line should be 8 or 10 pound monofilament or fluorocarbon line. Some bass anglers will use braid with a fluorocarbon leader. Are there special hooks for this? There is no consensus on what makes the best wacky hook. 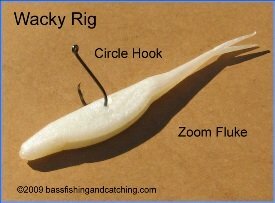 Some think a circle hook because the bass hooks itself (theoretically) as it swims off with the bait. 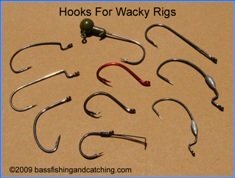 Others think a live bait hook or a Kahle hook is best. Bottom line, almost any hook with an open throat will work. It's up to you to find the style that works best in your hands and with your chosen baits.